Apple’s Core Audio Format (CAF) is a file format for storing and transporting digital audio data. It simplifies the management and manipulation of many types of audio data without the file-size limitations of other audio file formats. CAF is fully supported by Core Audio APIs in OS X v10.4 and later and in OS X v10.3 with QuickTime 7 or later. It is supported in iOS starting in iOS 5.0. CAF provides high performance and flexibility and is scalable to future ultra-high resolution audio recording, editing, and playback. Unable to add CAF to iTunes and syncing CAF to their mobile devices including iPod, iPhone, iPad for enjoy on the go. Trouble to importing CAF to early version iMovie like iMovie HD Unable to load CAF files with 6 channels (5.1 CAF). Difficult to play CAF Audio with Windows Media Player and other media players. Unable to open CAF files with Windows Movie Maker, PowerPoint, and other Windows software. Be warned when upload iMovie creations to YouTube if CAF audio files from iLife Sound Effects Library are used. To solve the headache issue, converting CAF to MP3, a much more versatile and compatible format across operating systems is recommended. If you are concerned about the output audio quality, converting CAF to 320kbps MP3 or converting CAF to lossless WAV will help you reserve much audio quality during the conversion process. You may have specific needs like convert CAF to M4R, WMA, AAC, AIFF, or convert CAF to M4A. UFUSoft Video/Audio Converter (for Mac) is a great Audio files Converter, which provides an easy way to convert your favorite audio files on Windows or Mac OS X. 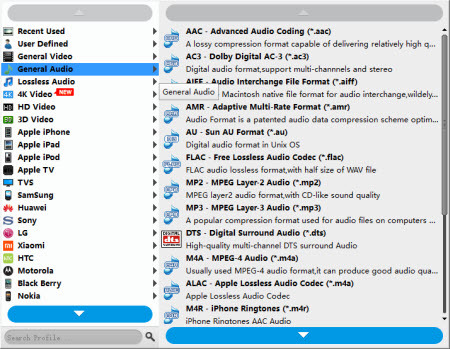 Many audio files can be converted among CAF, MP3, WMA, WAV, M4A, M4R, M4B, AAC, AC3, OGG, AIFF, FLAC, MKA, etc. The great software supports batch audio files conversion that means you can convert multiple audio files at the same time. What’s more, you can use this audio converter to extract the audio track from all popular movies or music videos, such as AVI, DivX, WMV, MPG, MOV, MP4, H.264, 3GP, ASF, VOB, MKV and so forth. Free download the trial version, you’ll get the ideal audio formats with perfect sound quality. 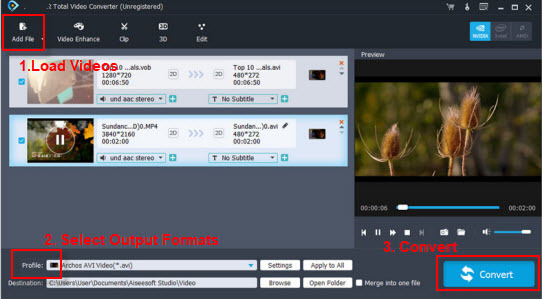 Drag and drop the CAF files or the CAF folder directly to the main interface of UFUSoft Video/Audio Converter. Or click the “Add files” button to import CAF audio files to this CAF converter. Click the drop-down button right beside “Profile” to set output profile to MP3, WAV, M4R, M4A, AIFF, or other of you desired audio formats and define the destination folder. * To play CAF in iTunes, iPad, iPhone, iPod, Apple TV, any version of Mac, iMovie and Quicktime, converting CAF to MP3, AIFF, M4A, M4R is recommended. * To play CAF files in Windows Media Player, PowerPoint, Windows Movie Maker, converting CAF to WAV, MP3 is recommended. * To edit CAF in Sony Vegas, Avid, and Adobe Premiere or to play CAF on Android, Samsung Galaxy, PS3, Xbox 360, BlackBerry, we had better convert CAF to MP3 or WAV. * To play CAF in RealPlayer, we can convert CAF to RA, MP3 and etc. Click “Setting…” to open “Profile Settings” Window where you can adjust audio volume to desired level, increase or decrease audio bitrate, change audio codec. To convert CAF to 320kbps MP3, go to “Audio Settings” secion. Click the “Audio Bitrate” drop-down and select 320. To convert CAF to 24 bit WAV, in “Audio Settings” section, choose “WAV 24bit” in the “Encoder” drop-down. Click “OK” to save the setting. Press “Convert” button to start the CAF conversion. It will be finished with high output quality and fast converting speed. After the conversion is done, click “Open Folder” in the bottom of the software interface to locate the converted file. Converting CAF and 6 channels CAF to MP3, M4R, WAV, AAC, M4a, OGG, etc is just that easy and fast with the professional CAF Converter. Go ahead to enjoy your work now. « How to convert .caf file to .m4r file as iPhone Ringtones on Windows/Mac?